Phare de Cordouan is part of the Tentative list of France in order to qualify for inclusion in the World Heritage List. I visited this tentative WHS in July 2016. It was a real adventure and I really enjoyed my visit. There are 3 ways to visit the lighthouse itself or else you can take any excursion from Royan or Le Verdon-sur-mer just to get you up close to the lighthouse. I think the latter option would be a real shame is not only would you pay a lot of money (36 euros) just to see the lighthouse without actually visiting it but also because you'd brave the choppy seas just the same so I'd recommend paying the extra 10 euros which should go directly to the coffers of the lighthouse preservation team which do a lot of restoration work every winter. If you decide to visit the lighthouse, you can either visit with Royan Cruises, La Sirene Cruises or Cordouan Express from Royan, with Vedette la Boheme from Le Verdon-sur-mer, or with La Cote de Beaute from Meschers-sur-Gironde. The prices are pretty much the same (46 euros inclusive of the 10 euro lighthouse entrance ticket). I opted to visit from Royan as I wanted to visit the nearby Rochefort and the Rochefort-Martrou Transporter Bridge (similar to the inscribed Vizcaya Bridge in Spain). There are trips to the lighthouse everyday and the companies take it in turns to visit on alternate days. I tried to choose a day with a high tide coefficient to be able to experience a short "walk" from the exposed sandy banks to the Cordouan lighthouse. Booking ahead is highly recommended and I preferred Royan Cruises over La Sirene Cruises simply because the latter company required my credit card details AND secret number over the phone which I wasn't comfortable with especially since trips can be cancelled without notice according to the weather conditions on the day. Royan Cruises took my reservation over the phone and I paid upon arrival 1 hour prior to the trip. Moreover, the company's service was very good and an amphibian vessel is used towards the last bit near the lighthouse to get you as close as possible to the submerged jetty. Another positive note was that a local author who published the very good information book on the Cordouan lighthouse, Frederic Chassebouef (Cordouan - roi des phares), happened to be on board when I visited and we had a very fine chat together on the pros and cons of Cordouan's inscription on the WH list. After around 45 mins at sea from Royan, the amphibian vessel approached our boat and one by one we safely went on board to be taken as close as possible to the sand banks. Then we literally walked the last 20mins or so in the middle of the sea with water just above knee level till we reached the wooden door and staircase guarded by the lighthouse guardian. The lighthouse guardian actually lives in the lighthouse every other week and alternates with another young lighthouse guardian. He's in charge of letting people in after having made sure that everyone has paid the 10 euro ticket and then does a short talk explaining the lighthouse's transformation over the years and its importance. Cordouan is an active lighthouse located 7 km at sea, near the mouth of the Gironde estuary. 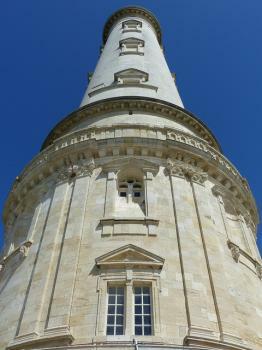 At 68 metres, it is the 10th tallest traditional lighthouse in the world and by far the oldest in France. Its construction started in 1584 and it was completed in 1611. Its main highlight and OUV is that it is a Renaissance masterpiece, in that it is an amalgam of a royal palace, a cathedral and a fort, all in one unique lighthouse. Small beacon towers had existed on the islet since 880, but the first proper structure was implemented by the "Black Prince", since Guienne was then an English province. Passing ships paid to pass by and it is believed that this was the first known instance of lighthouse fees. A small chapel was also built on the islet, however, by the second half of the 16th century, the tower fell into disrepair and the hazard to navigation threatened the Bordeaux wine trade which led to the 'tower' construction. Moreover, a round base was built to take act as a wave breaker. Within it was a cavity for storing water and other supplies. Above it the tower had 4 floors. The ground floor had apartments for four keepers. The middle floor had a richly decorated entrance hall and the second floor housed the King's Apartment. The top floor consisted of a chapel with a domed roof. The architectural genius still visible today is that instead of removing the domed roof the lighthouse was later extended further to today's length with spiralling stairs. Moreover, the first turning lighting dish in the world was used here and in 1823 the first lens rotating system was installed in Cordouan, two very important steps for worldwide navigation. By the time I climbed the 301 steps up and down and explored the lighthouse, the tide had retreated further and the jetty to the amphibian vessel was no longer submerged. Instead I had to keep my balance while walking on some very slippery algae and several bivalves. The whole trip takes around 4 hours and if the weather is fine you have around 2 hours to visit the lighthouse itself. A banner was displayed on the round base stating Cordouan's candidature as a UNESCO WHS but several locals are against its inscription mainly because it already receives enough money and protection as a national historic monument and the current number of visitors is quite controlled to be able to safeguard the marine/estuary ecosystem without an excessive negative impact. Personally, I think this is truly one of the best sites France has to offer and well worth the effort for an unforgettable experience. Very impressive lighthouse on a rock outside Royan. The volume, age and history is impressive but information is poor, even in French language. It is a small adventure of its own to get out there and the complete set makes it a nice tour out on a nice day.